Hey NHL, you want a little tip on how to make the game more entertaining? Just put a microphone on P.K. Subban. It’s that easy. In last night’s game between the Nashville Predators and Colorado Avalanche, Preds blue liner Subban was mic’d up and he had absolutely NO problem letting people know what he thinks of things out on the ice. 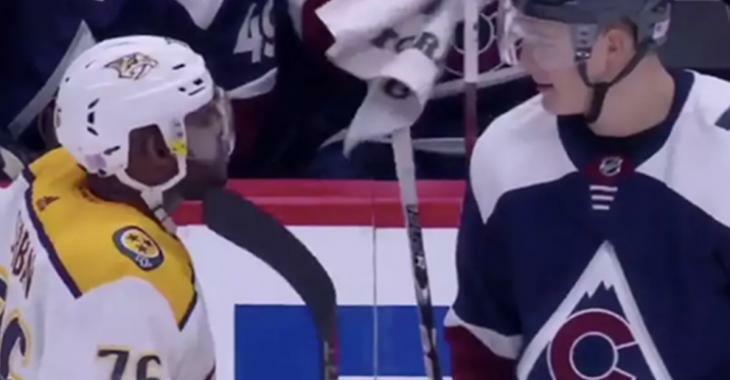 In maybe the highlight of the game, Subban got into an epic chirp fest with Avs giant Nikita Zadorov. Zadorov isn’t a terrible player by any means, but let’s be real… he would absolutely mop the ice with Subban in a fight. Luckily for Subban that’s not his game. He’s an up tempo blue liner who loves to rush the puck and get in people’s faces. And you know what? He’s about the best in the NHL when it comes to that. He’s also, as evidenced by his razor sharp barb hurled at Zadorov, a world class trash talker.